Does your bank have exposure to oil and China? Over 4 months ago, in September, we released two pieces covering two very different topics. First, we argued that the stock market might have been overvalued at that time. The CAPE ratio was around 25, 50% above its historical mean. Second, we published an article on CoCo bonds and their danger to the global financial sector. After a turbulent bond-ride for Deutsche Bank, the general media finally seemed to have taken notice of these ‘exotic’ bonds. Meanwhile, bank CEO’s and policy makers rushed to the CNBC and Bloomberg studios to explain to the public that everything is perfectly fine. Major stock indices around the world are still down, however. The three culprits causing this decline are 1) concerns over China, 2) low oil prices and 3) monetary policy. Another problem has risen to the surface during the last few weeks: banks. What do we make of this? Much of this positive correlation can be explained by the tendency of stocks and oil prices to react in the same direction to common factors, including changes in aggregate demand and in overall uncertainty and risk aversion. However, even accounting for these factors, the residual correlation is close to zero, not negative as we would expect if it were capturing only beneficial supply shocks. There are several other explanations that could be investigated: for example, the possibility that declines in oil prices, even if initially caused by higher supply, affect global financial conditions by damaging the creditworthiness of oil-producing companies or countries. Then there is the China problem. Some spectators fear a ‘hard-landing’ in China, a thought shared by famous billionaire investor George Soros. After revealing doubts on Bloomberg TV in January, the Communist Party even warned Soros not to bet against the Renminbi. Slowing growth in China is a problem in many different ways. First of all, it scares investors when the second largest economy in the world slows down: risk-off. 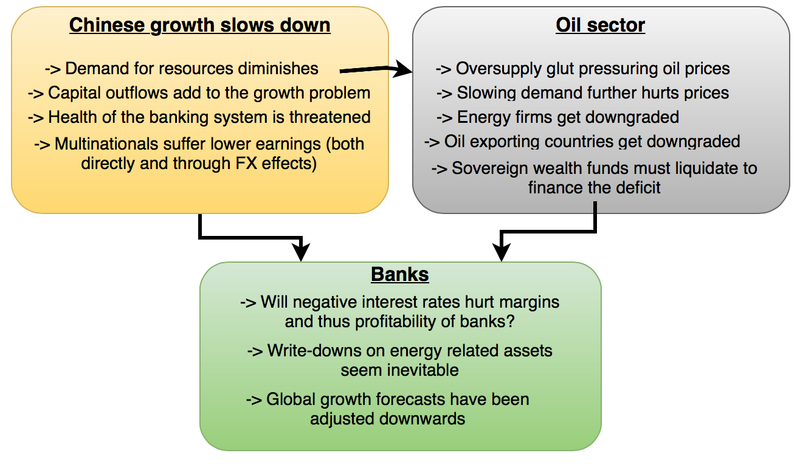 Secondly, it could lead to increased capital outflows worsening the situation. Thirdly, it will most likely increase the percentage of non-performing loans, thus damaging the banks which are needed to fuel the economy. Furthermore, slowing growth in China could mean slowing demand for crude oil and natural resources as a whole. This adds to the oil glut. Finally, the marriage of slowing growth and rising debt levels could spoil the economic rise of China. Analysts note that tackling the shadow banking system and deleveraging certain parts of the economy will make combined debt levels rise to 250% of GDP. The question was whether your bank had exposure to oil or China, right? That’s because financials have joined the three culprits stalling the markets. There are valid concerns about the effects of policies such as nominal negative interest rates on the profitability of the banks. The capitalization ratio’s of certain European banks are fragile at best. In order to comply with new regulation in 2019, European banks must be able to retain profits to build more equity. Offering new shares would destroy value for existing shareholders as these flee to the exit. Bank stocks got crushed. The American banks Wells Fargo and Bank of America lost 14% and 30% respectively since the start of the year. European heavyweight BNP Paribas lost nearly 1/4 of its value. Deutsche Bank and UniCredit have lost over 30%. It’s not unusual to see bank stocks getting crushed during downturns. Financials tend to have high betas, meaning they are relatively more volatile than the market. Banks are the backbone of our economic system, so deterioration in fundamentals weighs heavily on their valuation. Banks don’t have to disclose much about the assets they are holding. It’s very hard to discover whether your bank is holding onto bad EM debt or dangerous energy investments. We know one thing, though: if oil prices keep dropping, major energy companies will go bankrupt, dragging exposed banks down with them. This is a cause for concern for many investors, which react by selling off financials in their portfolio. Another developing issue is negative interest rates induced by central bank’s monetary policies. With inflation figures in Europe disappointing in a number of countries, more measures could be announced. As Bloomberg reports, inflation in Germany is at negative 0,2 percent. Such a figure could spur further expansionary policies from the ECB. One of the solutions might be introducing negative real interest rates. This policy could deteriorate the net interest margins for banks, thus hurting their profitability. The direct effect of slower Chinese growth and low oil prices is another headwind for stocks and banks in particular: lower global growth. The OECD is one of several watchdogs that is cutting global growth forecasts. Two additional problems remain to be discussed. First of all, sovereign wealth funds of oil-exporting countries have to sell positions to provide for their governments. These funds were set up to be used in case of a rainy day: crude oil at $30 a barrel is an emergency. This phenomenon is eating up liquidity in the market. The second problem stems from feedback loops of bank stocks declining. Some argue that falling share prices have no effect on the real economy. They state that the impact on the real economy, through wealth effects, is not significant. Although this might be true in the short term, there is one sector that can easily fall prey to the boom-bust cycles and cause turmoil in the real economy: the financial sector. Falling share prices can lead to public unrest and spark a bank run. This is a way financial crises often start. These doubts can also result in actions of colleagues not willing to do business with a certain bank anymore, damaging the strength of the bank in question. It will also directly hurt the ability of banks to raise much-needed capital to better their balance sheets. All of these concerns have resulted in the markets going down, with financials leading the way. Especially European banks have had a hard time. Relative to their American counterparts, they have not yet raised enough capital. Fear of additional monetary policy measures, in the form of negative real interest rates, add to the problem. At the end of September, the S&P 500 was at 1920 points, almost exactly the same level as today. The market went up for another month but started to flatten until disaster struck in January. Having dropped double digits since, most markets are now back at their September levels. The S&P500 lost 7,5% in 2016, but was able to remain in the green compared to September 2015. The FTSE has shed nearly 5% since the start of the year, but managed to close positive relative to September levels. A drop of over 20% in less than two months made the Shangai Composite Index the worst performer with a 5,8% loss relative to September. The DAX has lost less 10% since the carnage began, resulting in a slightly negative position compared to September levels. There’s one question that’s ought to be on every investor’s mind: will the market move up or down? Picking the right stock at the right time is very difficult for the retail investor. Many try to make a profit buying ETF’s that follow major indices. By doing so they eliminate unsystematic risk as their portfolio is diversified over numerous stocks. Market risk, however, is a major force driving markets either north or south. The dramatic start of 2016 raised many different questions, but an investor seeks to solve the one that rules them all: up or down? Because of all the negative momentum lately, some might argue that there is more fat to be skimmed. As Charlie Munger once said: “Markets tend to keep going in the direction they have been going.” This is, of course, something Newton explained centuries ago with the first law of physics: an object in motion stays in motion with the same speed and in the same direction unless acted upon by an unbalanced force. Others argue that the only way to make money is being a contrarian investor. They often point to a phrase coined by Munger’s famous business partner Warren Buffet: “Be fearful when others are greedy and greedy when others are fearful.” The conclusion is that we can’t rely on momentum-analysis. The bulls and bears are both making a case, and only the future can tell who was right. Four months after publishing an article on the exaggerated valuation of the market, the market itself has first risen and then returned to the September level. If we thought valuations were high at that point in time, what do we think about them now? Does new economic data justify these prices, in the sense that the global outlook has evolved positively? Or does this market reaction proof that some doomsayers were right and investors are finally pushing prices to more sensible levels? In other words: up or down? Previous Post: [GUESTPOST] To Patent or Not? Next Post: Since when are rising oil prices a positive for the markets?